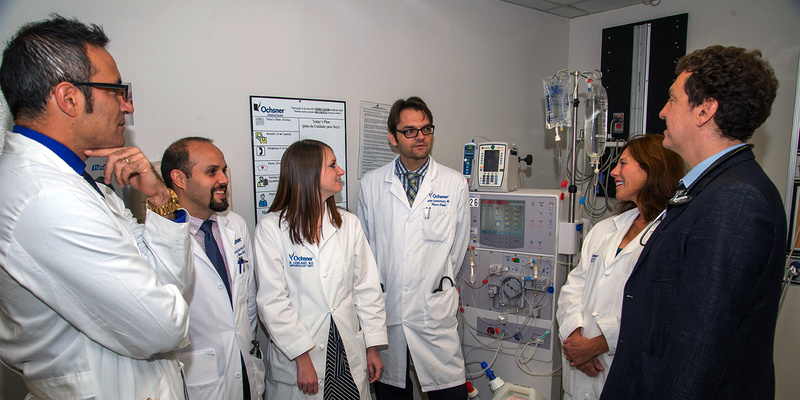 The Nephrology fellowship at Ochsner Medical Center is a 2-year program working with one the 11 best kidney and liver transplant centers in the country. Although this program was only recently approved by the ACGME in February 2012, Ochsner has a long tradition of Research, Education and Excellence in patient care. The fellowship program then leads to certification in Nephrology by the American Board of Internal Medicine. Our goal is to train physician-scientists to become competent academic or clinical nephrologists. The fellow gains experience in critical care nephrologic problems, electrolyte and acid-base disorders, acute and chronic renal diseases, hypertensive emergencies, ESRD patient complications and all forms of dialysis and other extra-corporeal treatments. The fellow functions as an consultant and primary care physician for renal patients under the guidance and supervision of a board certified rounding nephrologist. The renal fellow closely interacts with other services such as surgery, interventional radiology and pathology during these rotations. The renal fellow functions as a junior attending while rotating on the renal floor, where the majority of nephrologic patients are admitted. The fellow guides the care of the medical residents assigned to the renal floor service as well as the residents rotating on the renal elective. The fellow directs the management of the consultations, supervises the residents patient care, and plays an active role in educating the medical housestaff. During these inpatient rotations the fellow also cares for patients in the inpatient dialysis unit. The fellow is responsible for writing dialysis prescriptions, dialysis scheduling and caring for the dialytic and medical issues that arise.